For more than a decade, the Bluerock Tools has been one of America’s most respected tool manufacturers. Even though they’re not as well-known as Milwaukee or Black & Decker, their products are quite famous for quality and reliability. That’s why we think it’s time to take a closer look at their popular magnetic drill – the BRM-35A. Of all the mag drills we’ve reviewed so far, this one is the most affordable. However, that doesn’t mean that it’s inefficient and that it has a poor build quality. The BRM-35A is, actually, more than capable of finishing every task you throw at it. For that reason, we’ll be analyzing the drill’s design and power; with the goal of finding out if it’s really the best device of this type in its price category. If you’re on a tight budget but still need a mag drill for your workshop, read on! Powered by an 110V/AC motor (60Hz), this drill is capable of achieving the maximum speed of 570 revolutions per minute. It has the drilling depth of 2 inches and the drilling capacity of 7/16″ – 1 1/2″ (with the annular cutters), making it a pretty good choice for drilling steel plates. For the price that it comes at, the model also sports a pretty good design, albeit not the best one we’ve seen so far. Weighing almost 30 pounds, it has a big 3-spoke wheel and a set of easy-to-operate controls. It comes with a couple of handy accessories, such as the hard-plastic carrying case. As we said, the Black Bluerock BRM-35A sports a simple but functional design. There are no pretty curves here – the whole thing looks plain and robust, which is exactly what we expected at this price. It weighs 28 pounds and has the dimensions of 20″ x 8″ x 15″, so you won’t have any problems when it comes to transportation (especially with the included carrying case). On one side of the drill, you find a 3-spoke wheel and a set of straightforward controls (motor, magnet, and 2A). 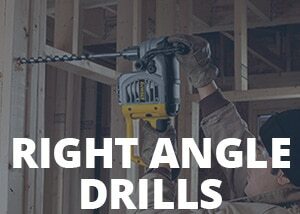 Handling the whole drilling process is exceptionally easy – there’s a user manual for those not experienced with magnetic drills. The heart of this mag drill is its 110V/AC 60Hz motor, with the maximum speed of 570 RPM and the magnetic adhesion of 2600ft/lbs. With this power and with the drilling depth of 2″, you’ll be able to easily tackle all sorts of tough materials. However, it’s important to mention that only the short bits fit with the included chuck (there’s less than 4″ of space between the base and the chuck). During our testing, we’ve tried drilling in the horizontal, vertical, and the overhead position. The results were impressive – BRM-35A works just as advertised. The Black Bluerock BRM-35A comes with a 90-day warranty, which is not that generous and far from today’s standards. However, the manufacturer was kind enough to include a couple of handy accessories – there’s a hex wrench, a safety chain, the chuck (with an adapter and a key), the feed handles, and instruction manual, as well as the convenient hard-plastic case. The fact that this model is the cheapest mag drill we’ve reviewed so far doesn’t make it unworthy of being considered for purchase. It is, on the contrary, an excellent choice for those on a tight budget since it’s easy to operate and has enough power for drilling through thick steel. During the testing, we used this model in a number of different positions and on a couple of different materials. The results were wonderful, although one can’t expect the amount of efficiency found on premium models. Thanks to the informative user manual and straightforward controls, using BRM-35A is exceptionally easy, making it a suitable choice for the beginners in the construction business. Even though we were very pleased with the model’s efficiency, we can’t recommend it to those looking for raw power that makes short work of anything you throw at it. For a really powerful magnetic drill, you’ll have to reach deeper into your pocket – the BRM-35A is a budget model and as such is not suitable for the more heavy-duty tasks. We didn’t like that the unit comes with (very) short 90-day warranty. Three months of warranty period is far below today’s standards, and something that makes one question the drill’s durability and reliability. We think that Bluerock should have put at least a 1-year warranty on this model. Those that bought BRM-35A are very pleased with how it works; saying that it meets their expectations and that it assists them with drilling steel on a daily basis. Users state that the model sports an unbeatable price and that it’s one of the best deals they’ve seen when it comes to power tools. When it comes to complaints, a couple of users were displeased with the unit’s loudness and its variable speed. Furthermore, they have no love for the included warranty, and we tend to agree with them – 90 days is just too short. The fact that this efficient little model comes at such a low cost makes it a best-buy in its price category. The Black Bluerock BRM-35A is the best cheap mag drill we’ve reviewed so far, so we think that it’s safe to say that it’s an excellent choice for those on a tight budget. It’s not the most powerful unit for the money, but it’s sure to assist you with all of your steel-drilling projects – you won’t regret buying it.